A few months back I decided to jump into the modular world of Eurorack synths. I was in Portland, Oregon for a family reunion and decide to pop into one of several shops that specialize in modular synths. For someone that loves blinking lights and knobs to turn these are dangerous stores to enter. After spending most of the afternoon playing with all of the gear in the store, I couldn’t help but walk out with a starter rack and power supply. Why Modular Synthesis? Because it is Simple and Complex! 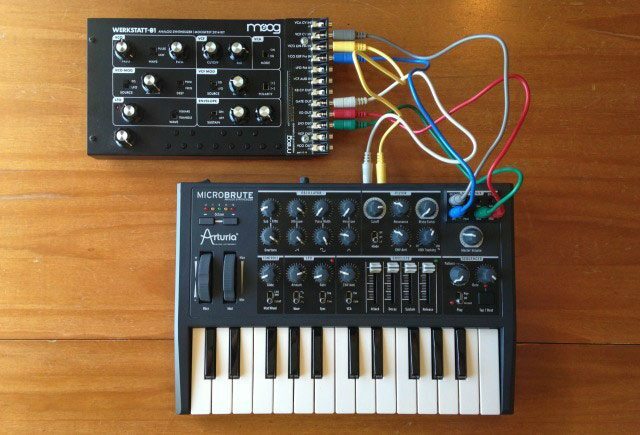 Two reasons kept drawing me toward modular synthesis. The first is the instant tactile control. There is a knob for frequency. Turn it and the pitch changes. That’s simple and fun! This simplicity was enticing after years of mapping midi controllers to an infinite selection of parameters in software and navigating hardware with convoluted menu diving. The second reason I was drawn to modular synthesis deals with the ability to organize the very building blocks of sound instead of working within a pre-mapped closed system. When a synth (hardware or software) is designed, it is often built with a predetermined workflow. 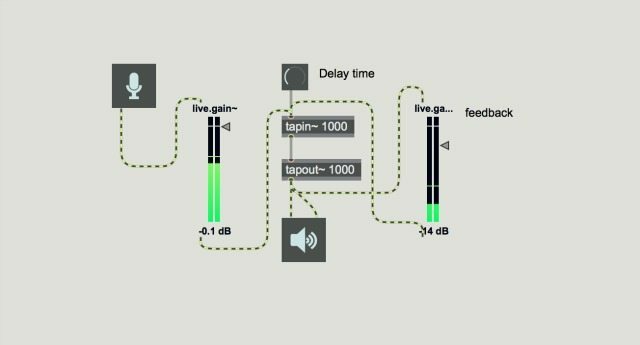 Modular synthesis works depending on how the end user determines. Think about it like plugging together several guitar pedals. The end user can put the distortion before or after the delay, and the outcome will be different. This way of working is similar to my experience in the object-oriented program Max/MSP with the added bonus of instant tactile control. This point is easy to gloss over if you have yet to experiment in sound design. The potential for experimentation and finding new sounds is what brings me back to my modular system every time. At first, I was intimidated by all of the patch points, knobs, and switches. I was afraid that I could break something by plugging one module into the wrong jack. Fortunately you can’t as long as you are going with the flow (in to out, never out to out or in to in!) 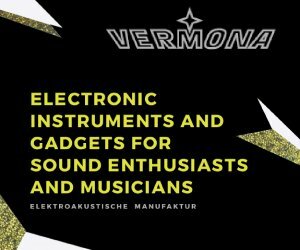 Eurorack design uses a standard voltage system that allows for advanced experimentation without worry. The best part about jumping into modular synthesis is that you can do it however you want. You can take an academic approach by reading and learning about how a waveform can be altered and then try it out or you can just jump in and start patching. Both ways are useful to gaining a comprehensive understanding of how synthesis works in theory and in practice. While synthesizers are complex systems, the parts that make up these systems are simple. Oscillators, filters, envelopes, and amplifiers are the fundamental building blocks of synthesis. An oscillator is a sound source, a filter subtracts something from the sound, an envelope defines the shape of the sound in time, and an amplifier changes the volume level (amplitude) of the sound. Knowing what these basic components do to sound helps the beginner to discover new sounds and understand how they are made. For those that aren’t 100% sure how modular synths work here is a quick introduction. A closed system synth goes something like oscillator > filter > envelope > output. In a modular system, you can decide the audio and control voltage paths to create complex sounds out of a very small selection of modules. For instance: oscillator > filter (with a cutoff controlled by second low-frequency oscillator) > modulating the frequency of a third oscillator > envelope (with the attack/decay shape controlled by a function generator that is controlled by the second oscillator.) The sound quickly takes on a dynamic quality that cycles in often unexpected ways. For further primer into the basics of synthesis, I suggest checking out the Tuesday Night Machines’ Modular Synth Basics on Youtube. They cover both the theory and practice of the fundamentals of synthesis for the beginner in a slow and thorough way. However there are less obvious costs that should be considered including tools, extra costs of shipping parts from at times three different suppliers for one module, as well as time invested. 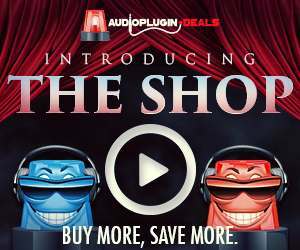 Most of these costs are upfront as you learn what tools work best, order parts in larger quantities, and become familiar with the steps to troubleshooting circuits. The second reason I was interested in exploring DIY is that I wanted to learn more about electronics and I thought this would be a great way to do it. I’ve always learned more about a subject when I was engaged in the material and there was some kind of real world application to the knowledge gained. The promise of weird sounds to come has been a great motivator as I’ve started learning about electronics. I decided to start by building a few kits. 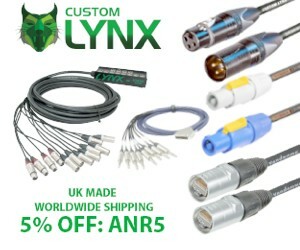 It might not be the least expensive option for DIY, but kits are a great place to start because there is no need to source parts (an aspect of DIY that can potentially take longer than the actual build.) Another reason I started with kits is because they have comprehensive documentation of the build process. 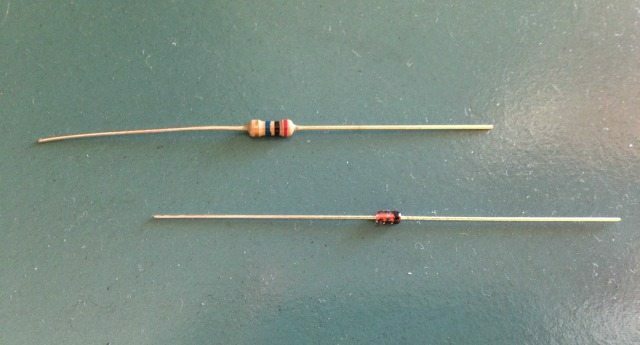 Some of them even include pictures of each step to compare to your own build along the way which is great when you start out and don’t know the difference between a diode and a resistor! I started with kits from Synthrotek and Thonk although they aren’t the only game in town. 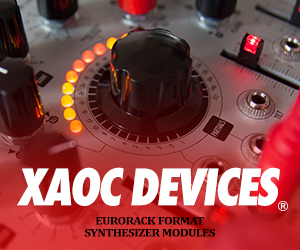 Synthcube and Modular Addict are also great places to find kits, pcbs, and parts. There is also an increasing number of companies that will ship their boards directly to you. Before I made the plunge into the modular world I tested the waters with several devices that are dubbed, “semi-modular.” Although I’m not fully satisfied with this nomenclature, it is what it is. These devices usually consist of a standard synth workflow with the addition of a few patch points that allow for alternate routing of the signals. The Arturia Microbrute was the first semi-modular synth I started with. It gave me access to route the LFO (Low-frequency oscillator,) envelope, gate, and pitch to control the filter cutoff, PWM (pulse width modulation,) or blend amount of the different waveforms contained within the Microbrute. Even though there was a limited amount of patch points there was still a lot of potential to create different sounds with different combinations. From there I purchased the Moog Werkstatt and its expander. The expander gave me a total of 12 i/os to connect with itself as well as the Microbrute. I could then do things like use the keyboard of the Microbrute to play the Werkstatt or send the sound of one synth into the filter of the other. 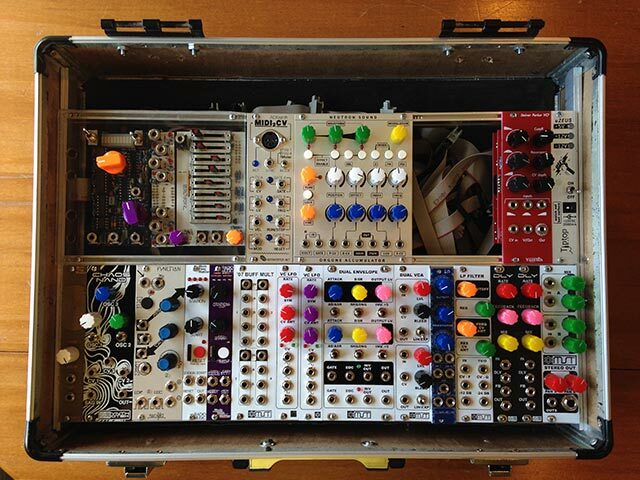 I was beginning to see the appeal of patching with a modular synth. These synths are compatible with the Eurorack environment, so I was able to supplement holes in my growing Eurorack system with the semi-modular synths. For instance, I used the envelope of the Werkstatt as my only envelope for the first three months before I built an envelope module. I’ve had a blast learning about and playing in the modular synth world. I’ve met kind and friendly people locally, in the forums of Muffwiggler, and on Instagram that share this enthusiasm and interest in sounds. Since starting this journey, I’ve used the sounds I’ve created with my modular synth for songs in my own band, in scoring a 40-minute post-apocalyptic zombie film, and as inspiration for a piano trio piece. Composer, Recording Engineer, and Educator. Recently completed his M.M. in music composition and spends most of his time teaching applied music technology at IUPUI, freelancing as a mix engineer, scoring for film and commercials, performing, and building synthesizers. You'll find him at www.chriskincaid.com. I have set up my Microbrute and Werkstatt in pretty much the same way Chris did, although i am using the Brute’s envelope to drive both VCF and and VCA of the Statt. From the picture of the set-up though, it looks like he has connected the Brute’s Gate Out to the Statt’s Gate Out… is it so??!? I do send the gate out from the MB to the WS gate out. If you go to the moogmusic page for the expander you’ll see that they suggest the gate out also functions as a quick and dirty gate in. Works great for everything I’ve used it for and allows for gate feedback which can be super fun! Give it a try! I wonder what I could be doing wrong.. do I somewhat need to somehow isolate the WS keyboard from the circuit so it doesn’t trigger its gate? Hey Marko, so I investigated. Plugged the gate out of MB to the gate out of the WS. I realized that I can only get the gate to register in slight pitch variations with the VCO MOD settings: EG, Amount all the way up, Dest: PWM. However when I send a gate out from my modular it has a pretty clear effect on the WS with the same settings. My guess (and it’s only a guess) is that the MB does not send a strong enough gate to be anything but super subtle for controlling the WS. So while the gate out of MB to gate out of WS does technically work, it’s maybe too subtle for most applications. There are folks that have modded the WS and added a legit gate in but I’ve never tried that mod. Plugging these two instruments back in after months of collecting dust has been really rewarding. The sounds I’ve been getting from this combination are so nice. Thanks for giving me a reason to plug them back up! I think we all get excited about our newest gear and can easily forget about the stuff we have used in the past. Have fun playing some music, Marko! Chris- Thanks for the great article. I’ve got both a MicroBrute and a Werkstatt… so seeing your patches was very cool. MY QUESTION: Per your image—How did you remove the original plastic knobs on the Werkstatt? I just ordered new knobs—but I can’t figure out how to get the original knobs off!! !